During May 2016 the Earth and Mars get closer to each other than at any time in the last ten years. The NASA/ESA Hubble Space Telescope has exploited this special configuration to catch a new image of our red neighbour, showing some of its famous surface features. This image supplements previous Hubble observations of Mars and allows astronomers to study large-scale changes on its surface. On 22 May Mars will come into opposition, the point at which the planet is located directly opposite the Sun in the sky. This means that the Sun, Earth and Mars line up, with Earth sitting in between the Sun and the red planet. Opposition also marks the planet’s closest approach to Earth, so that Mars appears bigger and brighter in the sky than usual. This event allows astronomers using telescopes in space and on the ground to see more details on the Martian surface . For observers using ground-based instruments the opposing planet is visible throughout the night and is also fully illuminated, making it a great opportunity for detailed studies . On 12 May Hubble took advantage of this favourable alignment and turned its gaze towards Mars to take an image of our rusty-hued neighbour, adding it to the collection of previous images. From this distance the telescope could see Martian features as small as 30 kilometres across. 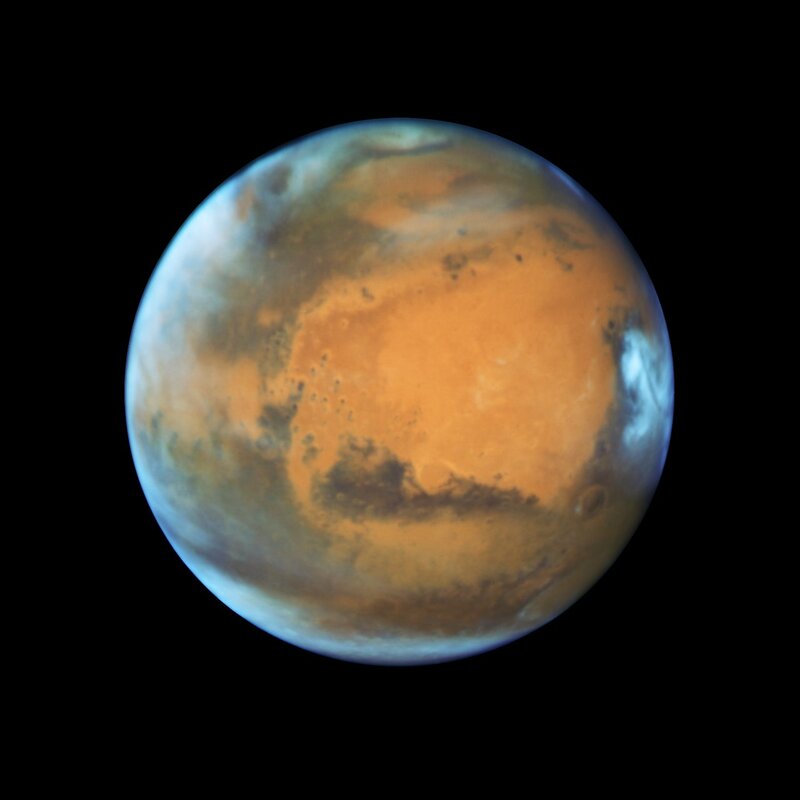 Hubble observed Mars using its Wide Field Camera 3 (WFC3). The final image shows a sharp, natural-colour view of Mars and reveals several prominent geological features, from smaller mountains and erosion channels to immense canyons and volcanoes. The large, dark region to the far right is Syrtis Major Planitia, one of the first features identified on the surface of the planet by seventeenth century observers. Syrtis Major is an ancient, inactive shield volcano. Late-afternoon clouds surround its summit in this view. The oval feature south of Syrtis Major is the bright Hellas Planitia basin, the largest crater on Mars. About 1,800 kilometres across and eight kilometres deep, it was formed about 3.5 billion years ago by an asteroid impact. The orange area in the centre of the image is Arabia Terra, a vast upland region. The landscape is densely cratered and heavily eroded, indicating that it could be among the oldest features on the planet. South of Arabia Terra, running east to west along the equator, are the long dark features known as Sinus Sabaeous (to the east) and Sinus Meridiani (to the west). These darker regions are covered by bedrock from ancient lava flows and other volcanic features. For Mars, the average time between successive oppositions — known as the planet’s synodic period — is 780 days — so the previous time that the planet was in opposition was April 2014. 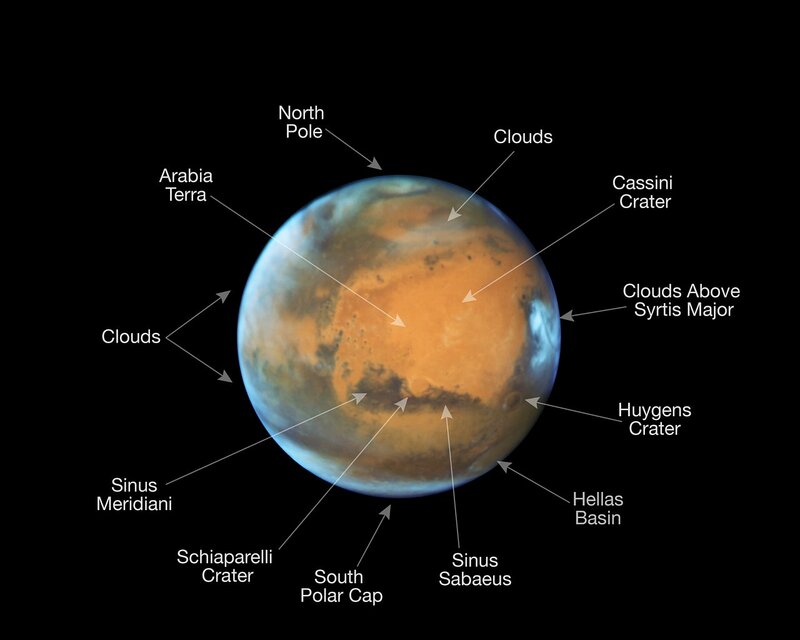 Hubble has observed Mars at (or near) opposition many times, including in 1995, 1999 (twice), 2001, 2003 (twice), 2005, and 2007. For a combined view of Mars’s appearance during the 1995-2007 oppositions see here, or see more Hubble images of Mars here. The dates of opposition and closest approach differ slightly. For 2016, opposition will occur on 22 May at 11:10 UTC, while Mars’s closest approach to Earth will occur on 30 May at 21:36 UTC, when Mars will be a distance of 0.503 au, or 75.28 million kilometres, from us. Mars’s closest ever recorded oppositional approach occurred in 2003, when it passed 55.76 million kilometres from us — the closest in 60 000 years. This is enhanced by the opposition effect, where an object’s surface appears particularly bright when the Sun’s light illuminating the surface is incident from directly behind our position as observers on Earth, as it is when Mars is at opposition. Opposition is also tied to Mars’s apparent retrograde motion, where the planet periodically appears to zig-zag backwards through the sky.